Born in Germany in August 1792, the woman who went on to become Queen Adelaide was christened Amalie Adelheid Louise Therese Karolina Wilhelmina. She was more than a quarter-century younger than her future husband who was born in August 1765. 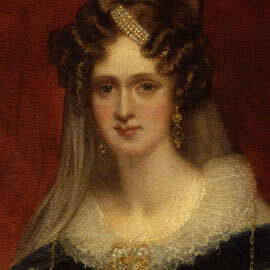 Queen Adelaide lived until she was 57 years-old (she died in 1849) while King William reached the age of 72, dying 1837. Adelaide was a pious woman, and was modest, charitable and dignified. Passionate about children and their rights, she was a driving force behind the abolition of slavery in England. It’s reputed, also, that Adelaide was the person responsible for the introduction of the idea of Christmas trees to the English. Having lost her father, George I (Duke of Saxe-Meiningen) at a young age, Adelaide had a strong female upbringing. She was well-educated and taught the finer details and subtleties of royal and diplomatic life very early on. To maintain the desired royal lines, it was arranged for Adelaide to marry William, Duke of Clarence, the wedding taking place in England in July 1818. The pair had only recently met. A frugal woman, she had her coronation crown manufactured at her own expense. William already had ten children to Irish actress Dorothea Jordan. The children were known as the FitzClarences, the prefix ‘Fitz’ denoting that they were illegitimate offspring. Still, as stepmother, Adelaide invested great time and effort into the children, helping to further the careers of the eldest, and taking on the responsibility of educating the younger children. It was Adelaide’s insistence that a portrait of their mother hang in the home. William was considered to be a buffoon, but during their marriage Adelaide helped improve his behaviour considerably. Together they lived a very simple life, and were even considered to be quite dull – was she the original boring Adelaide?! Unfortunate in producing children with the king, Adelaide suffered multiple miscarriages, eventually bearing a daughter, Princess Charlotte, who did not survive infancy. Adelaide was very fond of her niece, Victoria, who would go on to reign as Queen (from 1837 to 1901). King William reigned with his consort Adelaide for seven years, and most likely with her help, restored the respectability of the monarchy. Footnote: In Adelaide, South Australia, a bronze statue of Queen Adelaide by sculptor Lindsay Daen stands proudly in the foyer of the Town Hall. It was unveiled in 1980. The Queen Adelaide Club provides an exclusive social club for women, and each year the city celebrates Queen Adelaide’s birthday (August 13) with a tea party held in the Queen Adelaide Room of the Town Hall. Everyone who bears the name ‘Adelaide’ is invited to attend as an honoured guest. I really enjoyed reading about Queen Adelaide. I’m sorry to say I really knew nothing about her nor have I seen her statue in tbe Town Hall. I m8ght go and check it out and say hi to Adelaide. Hi Janine, thanks for the comment. Sad to say, until I went looking for the information, I was oblivious to all about Queen Adelaide (except for knowing that Adelaide was named for her). As the namesake of our city, I think she should be covered in SA schools as a matter of course – I’m pretty sure we never learned about her ‘in my day’, and I’m guessing that’s still the case. I’d be interested, if you could ask your kids, if they know much about our Queen. Cheers, Colin. But I do think everybody should know a little bit about Australia following their educational upbringing. Peter Holt.